Michael Flynn lied to the FBI, the Washington Post reports. 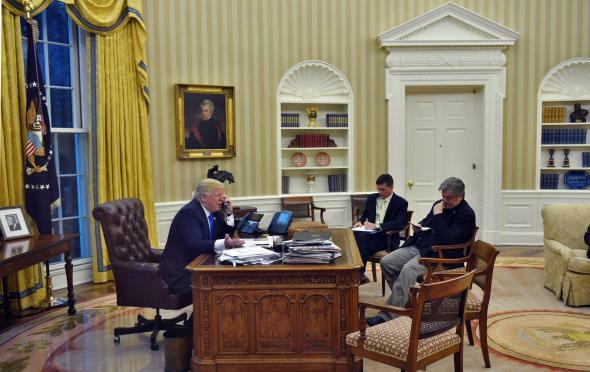 President Donald Trump speaks on the phone in the Oval Office, alongside Chief Strategist Steve Bannon and then–National Security Adviser Michael Flynn. Michael Flynn resigned this week as President Trump’s national security adviser after it became apparent that he had lied to Vice President Mike Pence and other White House officials about a conversation he had with a Russian diplomat about U.S. sanctions. Since such communication came before Trump was sworn in—and therefore before Flynn was officially on the job—it appeared to violate an obscure, centuries-old statue known as the Logan Act that bars private citizens from interfering in diplomatic matters. What seems to have cost Flynn his job, however, was not the communication itself but the embarrassment his attempted cover-up caused the White House. Flynn never appeared to be in any real jeopardy of being punished under the Logan Act, and congressional Republicans have to date shown no interest in pursuing the matter any further. But lying to the FBI is a felony, and doing that is a bigger deal than violating a little-known statute from 1799. Theoretically, Flynn’s lie to the feds could open him up to criminal charges—which would be more than a touch ironic given Flynn’s penchant for leading “lock her up” chants directed at Hillary Clinton during the campaign.